"An Agreeable Tyrant: Fashion After the Revolution"
The exhibition displays men’s and women’s clothing from 1780 to 1825 in a dozen period rooms throughout the museum. It considers how Americans fashioned a new identity through costume; on the one hand, Americans sought to be free from Europe, yet they still relied heavily on European manufacturing and materials. The DAR houses two historic document collections: The Americana Collection and the NSDAR Archives. A trust is an arrangement in which property is managed by one person or entity for the benefit of another. With a charitable remainder trust, you can receive income each year for the rest of your life from assets you give to the trust you create. Your income can be either variable or a fixed amount. After your lifetime, the balance in the trust goes to the charities of your choice, such as National Society Daughters of the American Revolution. There are two types of charitable remainder trusts. Get your free guide on annuity trusts. 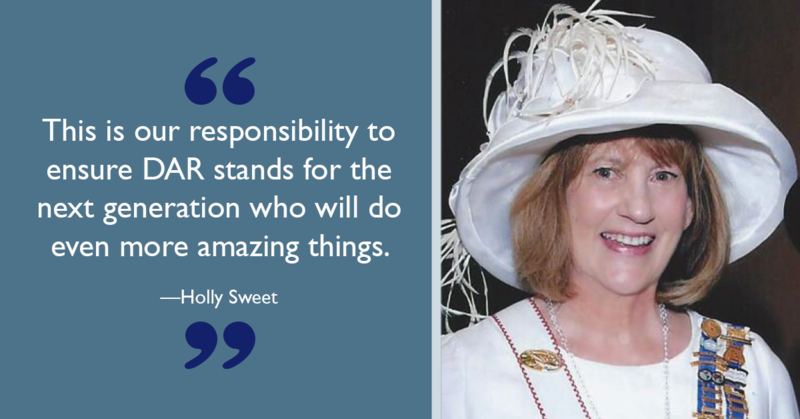 Calculate your possible benefits with a charitable remainder annuity trust. The unitrust pays you, each year, a variable amount based on a fixed percentage of the fair market value of the trust assets. The amount of your payments is predetermined annually. If the value of the trust increases, so do your payments. If the value decreases, however, so will your payments. 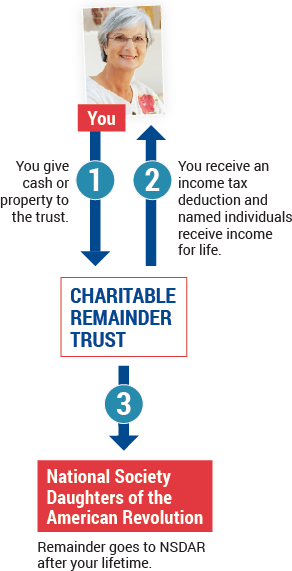 Calculate your possible benefits with a charitable remainder unitrust. Contact the Office of Development at (800) 449-1776 or giftplanning@dar.org with any questions about establishing a charitable remainder trust with NSDAR. We are happy to help, without obligation. A charitable bequest is one or two sentences in your will or living trust that leave to National Society Daughters of the American Revolution a specific item, an amount of money, a gift contingent upon certain events or a percentage of your estate. "I give to National Society Daughters of the American Revolution, a nonprofit corporation currently located at 1776 D Street NW Washington, DC 20006, or its successor thereto, ______________ [written amount or percentage of the estate or description of property] for its unrestricted use and purpose." A donor advised fund is an account that you set up but which is managed by a nonprofit organization. You contribute to the account, which grows tax-free. You can recommend how much (and how often) you want to distribute money from that fund to NSDAR or other charities. You cannot direct the gifts. You fund this type of trust with cash or appreciated assets—and may qualify for a federal income tax charitable deduction when you itemize. You can also make additional gifts; each one also qualifies for a tax deduction. The trust pays you, each year, a variable amount based on a fixed percentage of the fair market value of the trust assets. When the trust terminates, the remaining principal goes to NSDAR as a lump sum. You fund this trust with cash or appreciated assets—and may qualify for a federal income tax charitable deduction when you itemize. Each year the trust pays you or another named individual the same dollar amount you choose at the start. When the trust terminates, the remaining principal goes to NSDAR as a lump sum. A charitable gift annuity involves a simple contract between you and NSDAR where you agree to make a gift to NSDAR and we, in return, agree to pay you (and someone else, if you choose) a fixed amount each year for the rest of your life.